Verge ($XVG) has been one of, if not the most, talked about altcoins in the crypto space for quite some time now. If you are a member of the Twittersphere, as most of the crypto community is, you've likely heard thousands of Verge enthusiasts touting the incredible technology behind the coin - IP Obfuscation, Wraith Protocol, Atomic Swaps, VISP Secure Messaging, I2P, TOR... the list goes on. The problem is, unless you are highly experienced or informed on crypto technology, all of this information you are being fed by an enthusiastic Verge fan is likely going in one ear and out the other. The fact is not everyone knows what this technology means or does and, in reality, that die hard Verge fan may not even be able to provide you with a thorough explanation of the features they boast with pride. Luckily, you have this guide to teach you more about the spectacular features of Verge so you may one day sound like an expert in your daily crypto conversation. Let's begin with the definition of obfuscation: the action of making something obscure, unclear, or unintelligible. So, in the essence of IP addresses, IP Obfuscation essentially hides/obscures/masks your IP address, thus making the sender's IP difficult to figure out. If I might quote an intelligent gentlemen by the name Eric Kryski by citing his very informative article here: "...Wraith protocol is the obfuscation of IP addresses AND blockchain transactions. The technologies currently being used to achieve this are Tor AND stealth addresses..."
The Invisible Internet Project (I2P) is an anonymous network layer that allows for censorship-resistant, peer to peer communication. TOR (The Onion Router) is a service that allows you to hide your identity by moving your traffic between many TOR servers and encrypting your data. It cannot be traced back to you as they would see the data originating from one of the TOR servers. Wraith Protocol allows for fast, secure transactions by using technology called stealth addresses. This allows desired transactions to go to separate stealth addresses which send the transaction to the recipient. This transaction is hidden on the ledger and impossible to trace. Utilizing Wraith Protocol, this functionality can be turned on and off for either private or transparent transactions. Atomic swaps, or atomic cross-chain trading, is the exchange of one cryptocurrency to another cryptocurrency, without the need of a trusted third-party. 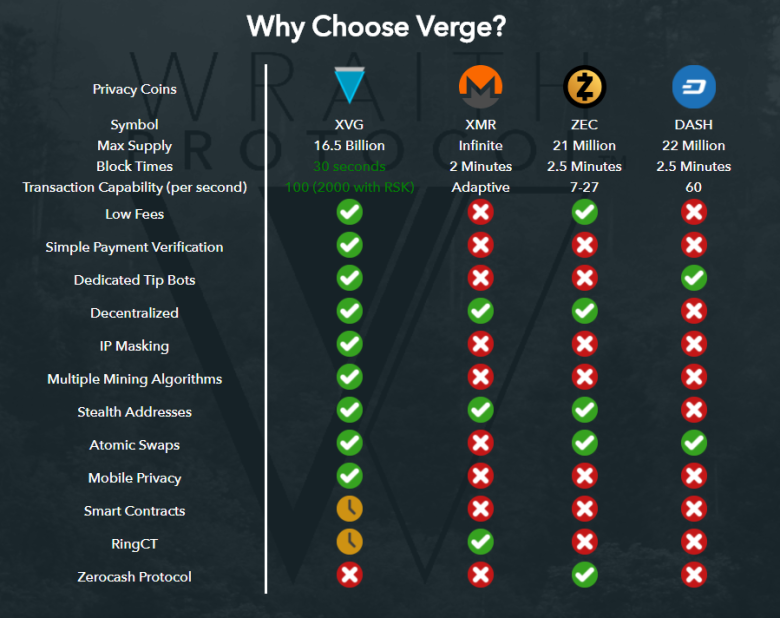 Atomic Swaps allow Verge to be used in DEXs (Decentralized Exchanges) which allow you to trade between Verge and other atomic swap enabled coins on a blockchain. This means that a company like Bittrex or CoinBase do not own your coins, instead they are instead stored in a decentralized exchange like crypto-bridge. Verge is the first and only cryptocurrency to have an Android wallet with TOR integrated. This allows for IP masking and anonymity on the move. It actually runs off of a mobile VPN. Pretty awesome. Side Note: An I2P Android wallet is expected soon. Coding RSK onto the Verge blockchain allows Verge to utilize smart contracts on the blockchain. This will also allow Verge to handle 2000 transactions per second which is 20 times faster than the current rate. Here's another exciting part - RSK will be able to utilize all the anonymity features we have already discussed. A smart contract is just like any other contract in which certain specified conditions must be met in order for funds to be received. It's all verified on the blockchain. RingCT stands for Ring Confidential Transaction. This technology creates multiple decoy transactions with different amounts in order to obscure how much is being sent. This technology is not yet integrated into the Verge code but is currently in the works and under development to ensure it is done properly and is working flawlessly. TokenPay is a decentralized and self-verifying payment platform project still in development (review their whitepaper here) that will be supporting Verge currency and is being audited by the lead developer of Verge to ensure security. TokenPay is working on banking options that will allow cryptocurrencies and fiat to be interchangeable payment methods. There are two options being discussed at the moment for the Verge debit card powered by TokenPay. TokenPay has achieved domicile in Switzerland and has indicated that they are in the advance negotiations of a partnership and hopeful eventual acquisition of a German bank. So... they will basically be a decentralized secure payment platform, with their own bank. The details are still being fine tuned but essentially there will exist one of two options or both (again still being developed). You open a bank account and when you send your crypto to it, it will be changed into fiat at the point of transaction. The balance will be insured because it's a legitimate bank. They offer a sort of pre-paid debit card option whereby your XVG will be loaded onto a debit card and changed into whatever local FIAT currency is accepted at the point of sale. Imagine then, that you send money using all the aforementioned privacy features provided by XVG, to a TOR enabled payment platform provided by TokenPay, loadable onto a Verge supported debit card. You are free to make purchases, vendors are none-the-wiser, and nobody (mainly oppressive money hungry tax-laden, corrupt government entities, or intrusive banking protocols) is flagging large sums of money leaving your bank account. The details and construction are still being ironed out and fine-tuned, but all of this is on the horizon for one of the most amazing crypto-currencies available to date. Verge. Departing Remarks: This article is in no way intended to insult other crypto projects but simply to inform. The information gathered is true and accurate to the best of my knowledge and not intentionally purposed to mislead or misinform. The dynamic nature of this market means that anything is subject to change without notice. We can all cohabitate in this space and still vie for the success of crypto-currencies as a whole. Our future success relies heavily on our ability to maintain professionalism and civility towards each other.